Webster University remembers Sister M. Cecily Jones (nee Margaret Blanche Jones), a Sister of Loretto, alumna and longtime faculty member who died peacefully on July 18. 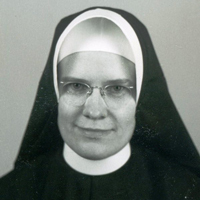 Sister Cecily's English courses were popular during her time as faculty member from 1949-1961. She also served as Dean of Women (dean of students) from 1955-1961, residing in Loretto Hall. 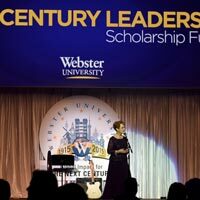 A prolific writer and poet, she can be seen reflecting on her time at Webster in several centennial videos. Next time you find yourself near Webster Hall, check out the newly installed centennial bench located front of the centennial flag pole. The bench is made from the wood of the Century Tree. The bench was commissioned last year for the centennial celebrations, but design and construction took longer than anticipated. Take a break and sit a spell under the centennial flag, honoring 100 years of the University's history. 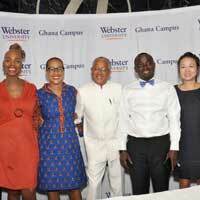 Webster's campus in Accra, Ghana, celebrated its final centennial event with 105 young African leaders, Webster students, faculty and staff in a partnership with the Young African Leadership Initiative (YALI) started by U.S. President Barack Obama. 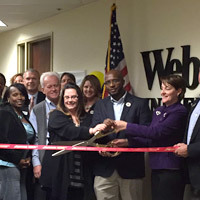 As a YALI RLC partner, Webster Ghana offers scholarship opportunities and provides support in leadership training for participants, and the YALI cohort has access to the campus for special lectures and campus events. 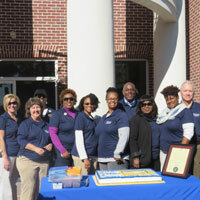 They came from every decade and every part of Webster University. 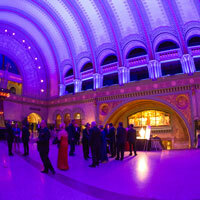 They were the presenters, the demonstrators, the dancers and the shakers who put on a show from morning and into the night for "Dance Through The Decades," one of the final events of an illustrious yearlong centennial celebration. 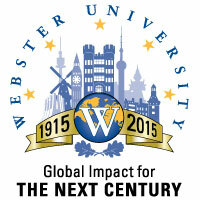 In commemoration of Webster University’s centennial anniversary, the Geneva campus inaugurated a Centennial Speaker Series with a theme that examines a critical issue from the last 100 years of human history and involves collaboration among multiple Webster academic departments. 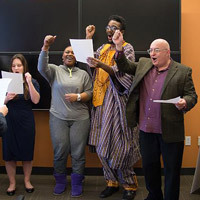 “Open Wounds: A Century of Crimes against Humanity" brings together the International Relations, Media Communications and Psychology departments by inviting scholars to reflect and present on this common theme. 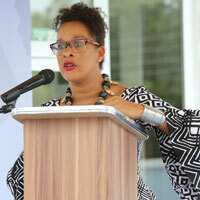 As part of celebrations to mark Webster’s centennial year, the Ghana campus hosted a public lecture, Global Citizens in Africa – Leading the New Century, in Accra on Nov. 4. The lecture provided a platform for lively discussion on how education and the concept of global citizenship can be used to assist aspiring African leaders who will propel the continent into the new century. Discussions centered around the core program areas of Webster University Ghana: Management, International Relations and Media Communications. 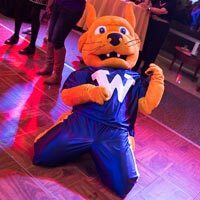 The all-day "Dance Through the Decades" event will celebrate the centennial through the language of dance with a variety of performers, lectures and other interactive events. One presenter will be Ron Elz, the radio legend marking his 61st year on the air, will present on "the teen scene" of the '50s and '60s. Hear a radio promo of Friday's events in Elz's "Johnny Rabbitt" character. 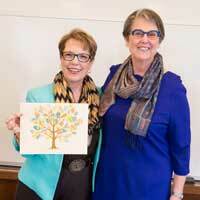 President Elizabeth (Beth) J. Stroble, chief communications officer Barbara O’Malley and members of the Centennial Planning Committee surprised Centennial Chair Elizabeth Thurmond Robb, BA ’65, at their last meeting by announcing that a tree has been planted in her honor in Centennial Plaza in front of Webster Hall.